Shark is certainly one of the most innovative vacuum companies in the world. If you look at their lineup from top to bottom you will see a lot of features exclusive only to them, or at the very least invented by them. So it’s not surprising that they have multiple robot vacuums that you can put on auto-pilot, letting them do the cleaning that you don’t want to. One thing Shark has always done is looked at what their customers want out of a vacuum, and then responded by filling those needs. The ION lineup demonstrates that perfectly. 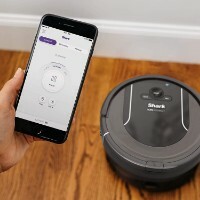 Shark ION robot vacuums come with various types of brush technology to let them move from hard floors to carpeting yet still keep cleaning effectively. The brushroll is self cleaning which is a great feature when you have it vacuuming your floors while you are away. If the brushes get clogged up and you aren’t there to fix them, there won’t be much point in running it any more. Shark recognized this and added an innovative feature to solve the problem. The ION will also run right up next to walls and it is equipped with side brushes to make sure each corner is covered. Corners are where dirt and dust can hide and many robotic cleaners will just push the debris there, but not these Sharks. The combination of uniquely placed brushes and ability to traverse all corners of a room mean you get far better cleaning than you would even expect. When you get a robotic vacuum you will need to program it to run on a regular schedule. Shark makes this an easy proposition with a couple of different innovative methods. You can use your smart phone to schedule cleanings and monitor the progress, from anywhere you want including your work office. This means while you are away you can make sure the ION is doing its’ job. Likewise, you can also use voice commands while at home if you just want to trigger a one-time cleaning. Gone are the days of bending down to push a bunch of buttons, trying to figure out how to make the vacuum respond correctly. Once it starts moving around the home, the Shark ION will use a variety of sensors to determine where the obstacles are. It will learn the best way to traverse around each room without damaging itself or anything in its’ path. And for an even more detailed vacuuming, some of the models come with what they call Multi-Axis Sensors which further heighten object detection to better complete the job. This is recommended for larger, busier households that have a lot of activity. R72 with Remote is their base model with Smart Sensor Navigation and an easy to use remote control. Like all of their robot vacuums it comes with a charging dock and removable filter. R75 with Wi-Fi is basically the same vacuum as the R72 but comes with Wi-Fi capability for use with the Smart Phone App. You can also use voice control while you are at home. R85 with Wi-Fi has all of the same features as the R75 but comes with a larger dust bin (0.7 quarts instead of only 0.45). This is recommended for larger homes. S87 Cleaning System is their top of the line model that comes with their innovative W1 handheld cordless vacuum. You get a 2 in 1 charging station that can simultaneously charge both vacuums. Their S87 really is a complete cleaning system. Shark packaged their highly popular W1 handheld vacuum along with their best robotic model, while giving you the ability to dual charge them. Both models come with highly advanced lithium ion batteries that last long and provide fade-free power throughout the entire cleaning session. The W1 also has an ergonomic handle, LED indicator light, a high efficiency motor, and one-touch debris emptying. It makes quick work of food and dirt particles that you don’t need a full sized cleaner for. And the self-cleaning brushroll on the S87 is designed for homes with multiple pets. It is great at picking up hair and dander that other robots would leave behind. 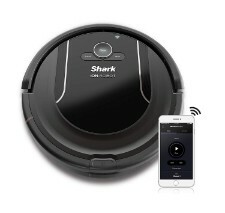 Robot vacuum cleaners are all about innovation, and Shark is definitely a company known for that. They have built a full lineup with different models to suit any household. From the base level R72 to the top of the line S87 you can easily pick the best choice without spending more than you need to. They all come with filtration, advanced brushrolls, lithium ion batteries, and various ways to program them. To read more consumer reviews and check online pricing, click here to visit our recommended supplier.